Saints dying for Ganga's sake keep piling up: Modi's Achilles heel in 2019 polls? 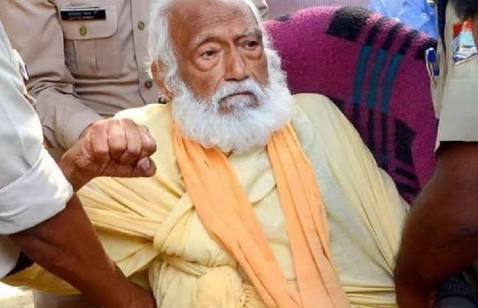 Former Indian Institute of Technology (IIT), Kanpur, professor, Guru Das Agrawal, who became an ascetic in 2011 at the age of 79 years and came to be known as Swami Gyan Swaroop Sanand, died on October 11, 2018 on the 112th day of his fast, demanding a law for conservation of river Ganga, at the All-India Institute of Medical Sciences (AIIMS), Rishikesh. Forty-years-old Sant Gopal Das, a Jain saint, who has fasted earlier for release of encroached grazing land for cows in Haryana, inspired by Prof Agrawal, also sat on fast for the same cause two days after Prof Agrawal began his fast, on June 24, 2018 at Badri dham temple in Badrinath. Presently he is in the Intensive Care Unit of AIIMS, New Delhi. Twenty-six-years old Brahmachari Atmabodhanand began his fast on October 24 as a sequel to Prof Agrawal's fast at Matre Sadan, which Prof Agrawal had chosen as the site of his fast. Even when Prof Agrawal was alive, the head of Matre Sadan Swami Shivanand had warned persons belonging to Rashtriya Swayamsewak Sangh (RSS), the ideological parent of ruling Bhartiya Janata Party (BJP), in power both at Delhi and Dehradun, who were visiting him that if anything happened to Swami Sanand then he and his disciples would continue the unfinished task undertaken by Prof Agrawal. Prof Agrawal's was 59th fast by a saint associated with Matre Sadan and Atmabodhanand's is 60th. Sixty-two-years old Swami Punyanand of Matre Sadan gave up food grains and is on fruit diet since Atmabodhanand started his fast on October 24 and is prepared to shift to a water diet in the event of Atmabodhanand becoming a casualty. Earlier, Swami Nigamanand, then 35 years of age, also associated with Matre Sadan, died on 115th day of his fast in 2011 in a government hospital in Haridwar demanding curb on mining in Ganga, which Matre Sadan claims as a murder by a mining mafia associated with the ruling BJP in Uttarakhand then. Swami Gokulanand, who fasted with Swami Nigamanand during March 4 to 16, 1998, a year after Matre Sadan was established, is also believed to have been murdered by mining mafia in 2003 when he was living in anonymity at Bamaneshwar temple in Nainital. Baba Nagnath died at Manikarnika Ghat in Varanasi in 2014 fasting for the same demand as of Prof Agrawal, to let Ganga flow uninhibited and unpolluted, Aviral and Nirmal, respectively. Both Swami Shivanand and Brahmachari Atmabodhanand in their separate letters to the Prime Minister have quoted Srimadbhagwat to say that when Ganga will become polluted with sins it will be the duty of saints to rid her of these sins by sacrificing their lives. But they have not remained content by considering it their duty to fast for Ganga as a religious exercise. They have chosen to criticise the government, its ministers, policies and also its attitude. Both saints have accused the PM of adopting consumerism driven development policies which view Ganga as merely water resources to be exploited for profits. They have reserved some harshest criticism for the Minister of Water Resources, River Basin Development and Ganga Rejuvenation, Nitin Gadkari, whose capacity for appreciating the dignity of Ganga has been doubted by Swami Shivanand. Swami Shivanand has come down heavily on Modi for his love for foreign sojourns and attempts to make cultural city of Varanasi into Kyoto. Atmabodhanand thinks that this government is 'nationalist' only for namesake, otherwise it has a western view of development. He has demanded from the PM immediate compliance of two of the four demands raised by Prof Agrawal -- halting of ongoing and proposed hydroelectric projects on Ganga and ban on any mining in it as an expression of homage to Prof Agrawal on behalf of the country. Atmabodhanand has criticised the government for having considered Prof Agrawal's fast as 'one man's intransigence.' He says Prof Agrawal represented the pain felt considering the condition of Ganga, state of global environment, immoral development policies promoting crime and corruption and the irrational man bent upon destroying all living beings, environment and the culture of co-existence. As the number of saints dying while fasting for the sake of Ganga keeps piling up and resolve of more of them to embark on the same path becomes stronger, it may be difficult for the country and its government to ignore this phenomenon. The BJP, now busy raking up the Ram temple issue in Ayodhya and the Sabrimala issue in Kerala, can ignore the issue of Ganga at its own peril. People haven't forgotten that the PM claimed that he got a call from Mother Ganga to contest his parliamentary election from Varanasi. There is a high profile and high budget Namami Gange project aimed at cleaning Ganga in place which seems to have achieved little. Ganga has become more polluted as much water has flowed through it since Narendra Modi won his election from Varanasi. In fact, the issue of Ganga could become Narendra Modi's and BJP's Achilles heel in the 2019 general elections.